I have been working on a series of small, usually 25 x 30cm, paintings for a while now. These are for my exhibition at Messum’s, London in March 2018. After making larger paintings, it takes time to start thinking on a small scale. So once I have the hang of the scale I tend to stay with it for some time. 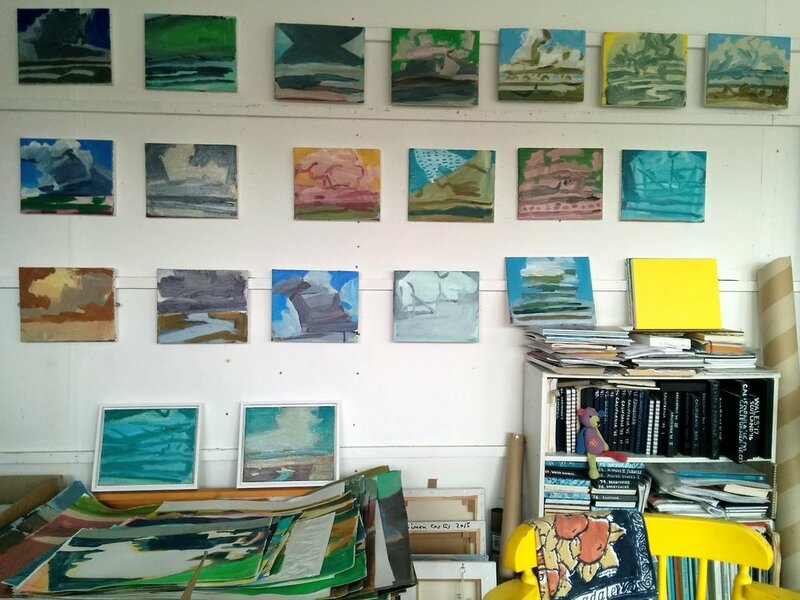 I have been working from drawings of clouds flowering over various landscapes and nearly all the paintings have a low Dutch horizon and a large sky. I paint from one drawing and when it starts to fail I scrape it off or paint it over and begin again, often from a different drawing. I like working with these edits and restarts and with the ghosts of previous attempts. The most recent paintings have emerged from drawings I made while out walking behind the seawall, noticing the shapes of the ditches and reed beds on the golf links. For these recent paintings I have been thinking about an ‘English’ palette of colours with less white, deployed against a flat background.